New Feature – Search Profiles. The search profiles can be used to quickly access sets of search criteria. The search profile saves all search settings (except the start/end dates) which can be loaded with a click of a button! Let us know of any feedback you have and any other suggestions or comments! On the same note, we have a lot of new and exciting features in development waiting to be released during the following weeks, so stay tuned! Also, FXCM Publisher users should do an update to their order2go api (an update of FXCM) by going to Start>Program Files>FX Order2Go>Update to keep their accounts updating. Wish you a ton of pips this week! So go right ahead and add your review if you’ve used any of the services. If you’ve used a service which is not listed, do let us know so we can add it to the list! Only 329(23%) of the accounts are profitable, 628(44%) aren’t profitable and 477 (33%) haven’t traded yet or haven’t closed a trade. The top 2 competitors are very close to each other and far away from the rest – there are still over 19 days left for trading, so at this point the prizes are still up for grabs for everyone. 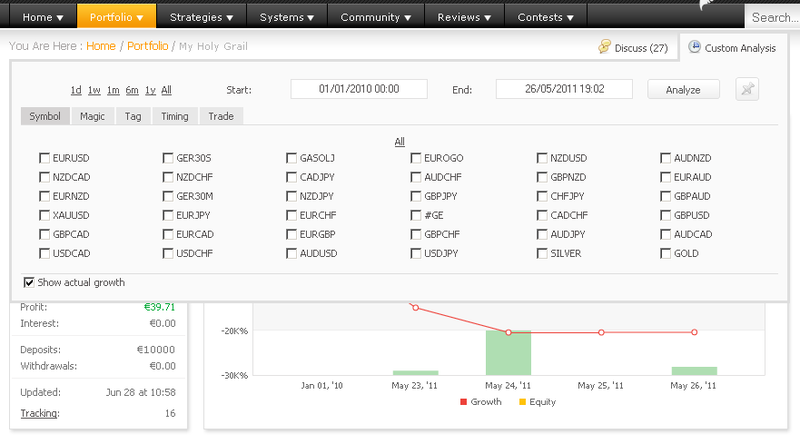 Custom Analysis Redesigned And Upgraded! Also, a quick update about our latest contest – there are 1,436 traders competing from 108 countries! 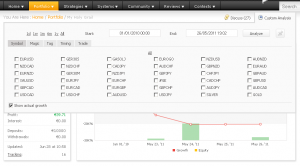 You are currently browsing the The Myfxbook Blog blog archives for July, 2011.